Another Air Terjun Pelangi in Pahang! The initial journey. There is not only one Air Terjun Pelangi (Rainbow Waterfall) in Pahang…..but also another one besides the one in Sungai Lembing……I would even say, a better one in Kuala Sentul, Maran, Pahang. At first I was skeptical. 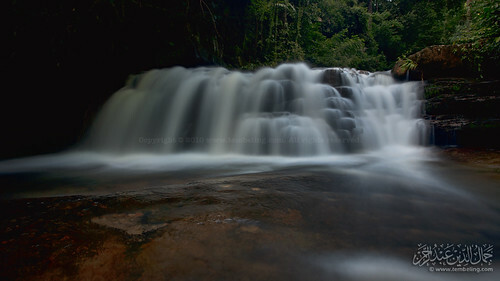 The first person who mentioned about the waterfall was Mat Jeri. Then my friend, dR Ali went there with him & few other friends. It was until I saw dR Alis’ pictures that made me want to go there & capture the beauty myself. Mat Jeri & dR Ali organised another trip recently & I decided to follow them. We went to this waterfall last week. To reach this waterfall, we drove for about 45 minutes from Kuantan to Maran, then took the turn to Kampung Kuala Sentul. Altogether I would say within one hour we could reach the Kuala Sentul Mosque, which was our rendezvous point. We hired a 4WD to get us from the mosque to the entrance to the trek to jungle. The 4WD journey was only about 15 minutes. But if you were to walk…..you may require 45 minutes through the palm oil estate. Sorry guys, this time, I didn’t bring any GPS device to reduce weight carrying some batteries. But thanks to Mat Jeri, he brought his GPS receiver & then he emailed me the GDB file for me to reconstruct the tract. From the entrance, we walked for about 1 hour before we reach the brim of the jungle. It was an uphill climb for about 200m high. We took a quick rest here. Then we continued the journey along a small stream before reaching a muddy area. We had another quick rest mainly because it was about to rain, and we had to cover our bags. 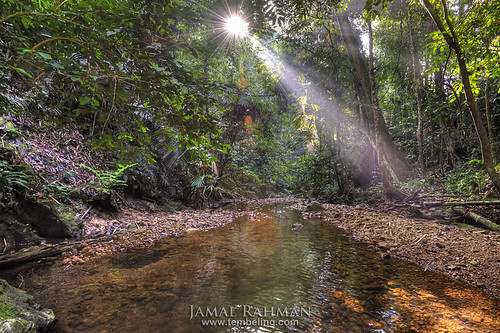 The next trek was through a typical tropical forest with rattan trees everywhere. Again, it was more uphill climb until we reach about 300m high. Then we entered even thicker jungle where the guides need to clear a lot of trees and bushes. We stopped at one small river to refill our bottles. After the river, the trekking got even harder with many hills to climb and leech (pacat) were everywhere. After about a total of 4 hours walking, we reached the campsite. What I did first was to clear all the leeches from my body. Plenty of them, as I was just wearing my Teva without any sock. I took me 15 minutes to clear them all. 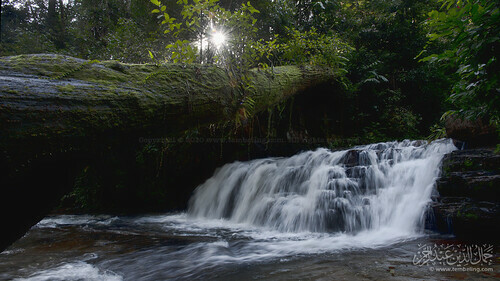 The campsite is known as Batu Hampar, where there is one beautiful cascading like waterfall just nearby. It was one of the best sight I have ever seen in Malaysia. The guides were busy setting up the tent while some of us were already unfolding the tripods & started shooting the magnificent scenery. Mat Jeri started fishing & we were surprised on how easy it was to fish here!! We were literally ‘transfer’ the fishes from the stream to the plastic bag. That night we had fried fish & sardines. Most of us slept comfortable on the hammock set by the guides. Some slept in their own tents. Went to Lata Mentagan with some extraordinary friends, dR Ali, Naser, Mizi, Nizam, Azman & Cikgu Redhuan today. Journey started at 7AM. Waited for Naser & then picked up Mizi & dR Ali. Went to a restaurant at Jaya Gading for nasi kerabu breakfast. Nizam (& son) & Cikgu Redhuan met us there. We continued the journey to Lat Mentagan at about 8AM. The journey was quite OK for the first 40-50km or so. Once we entered the entrace to Lata Mentagan, there is no more tarred road. If only I have a 4WD. So lucky I drove my Honda Stream. If I went in with my Avangarde? *horror* Once arrived, we parked our cars, distributed foods & mineral waters & proceed to the waterfall. None of us ever been there, so we do not know what to expect. A local dR Ali met previously said the trip to the waterfall only will take 30 mins but the your teens he met later told him 2 hours! So we just walked fast. We just follow the river & walked on the slippery stones. At some points the river was quite deep. After 1 hour walking, we reached the ‘lata’ or small waterfall. It is indeed very small & not so impressive. I didn’t even bother to use my tripod because when we arrived the sun is already veri high. I quickly snapped few macro shots. The fishes were friendly & swam with no fear around our foot. The pacat (leech) were even friendlier. I got one. Only realized when I was driving home…..inside my pant! How it got there? I already wore nice office socks & tucked-in my t-shirt! We spent about 2 hours at the waterfall (I’ll upload the pics later) & then for me, I went straight home. A weird thing happened….Mizi was infront of me & we were walking fast. But I need to adjust my tripod holder on my Lowepro Primus (a bad idea to have them adjustable!! ), so Mizi went ahead. I assumed he was always infront & I never catched up with him after that. But when I arrived at the car park. No one was there! I just worried Mizi might missed the path to the entrance. After 15 minutes waiting, suddenly Mizi arrived & he was surprised to see me. We never came across one another but how then I managed to walk pass him! We never wait for others as we know they were busy shooting insects for macro. So at 1:35PM we drove home. We were told that there are 6 more waterfalls further up but I am not sure about others, but for me I was just not convinced enough to walk another hour. Nevertheless our achievement was quite OK. We discussed among each other that we just arrived at Level 1. But that’s OK considering someone who had only reached basement!! Ha ha ha….. (janganlah anggap anda telah sampai di Lata Mentagan sekiranya anda tidak sampai ke air terjun nya!) .